Top 10 Free Things to See & Do in Paris. A holiday in Paris doesn’t have to cost a lot. In fact, if you do a little bit of research you’ll be able to see much of the City of Lights for free! To save you some time we compiled a list of our top 10 free things to see and do in Paris. From visiting free museums to discovering the Eiffel Tower up close without paying a dime, we’ve got you covered! Fancy seeing the Louvre or the Musée d’Orsay for free? You can visit all major museums in Paris for free on the 1st Sunday of each month! Understandably it can get quite crowded in the most popular museums of Paris on this day, so try to go early in the morning or late in the afternoon. You can also choose to visit one of the slightly less famous (but still absolutely fantastic) museums in Paris such as the Musée des Arts et Métiers or Musée Rodin. Are you a citizen of the European Union and under 25 years old? We have good news for you! You can visit all the museums in Paris free of charge. This applies to all major and small museums and even big attractions such as the Palace of Versailles. Do remember to bring proof of documentation such as a passport or identification card or you’ll have to pay! Not from the EU or older than 25? There are still several museums in Paris that are free to the public. For instance, the beautiful Petit Palais next to the Champs Elysées has a wonderful permanent collection of fine arts that is always free to visit. The Maison de Victor Hugo in the famous Place des Vosges also doesn’t charge an entrance fee. These are just two examples of the many free museums in Paris. 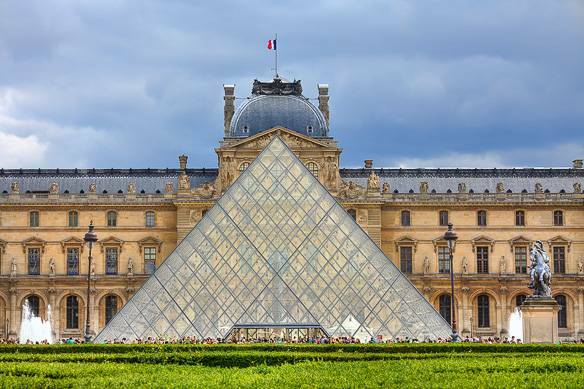 Check out Free Admission in Paris Museums for the whole list of museums that are free to visit. Paris is home to many gorgeous parks that are absolutely free to visit. In the city center of Paris you have the beautiful Jardin des Tuileries, Jardin du Luxembourg and Jardin des Plantes. There are also several sprawling green parks in the outer arrondissements, such as the Parc des Buttes Chaumont, Parc de Belleville, Parc Andre Citroen, and Parc de la Villette. You can even visit the Versailles Gardens for free off-season. Although technically this funicular railway charges an entrance fee, you can ride for free when you’ve got a charged metro card. The funicular runs between the foot and the summit of Montmartre, and is a great way to discover this Bohemian neighborhood. 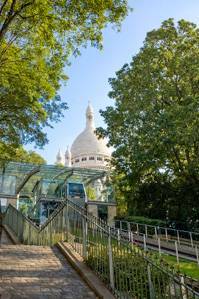 If you haven’t got a daily, weekly or monthly metro card you can also choose to climb up the hill through the park that runs up to the Sacre Coeur. From the steps of the church you’ll get amazing free panoramic views of Paris. To find out more about the area, check out our video tour of Montmartre. You’ll find many beautiful churches and cathedrals throughout the city of Paris, and most of these are free to visit. The popular Notre Dame Cathedral on the Ile de la Cité and the Sacre Coeur in Montmartre do not charge entrance fees. There are also many historic churches in Paris displaying ingenious architecture and striking stained-glass windows. You’ll find that when you walk around the arrondissements of Paris you’ll bump into amazing churches when you least expect it! 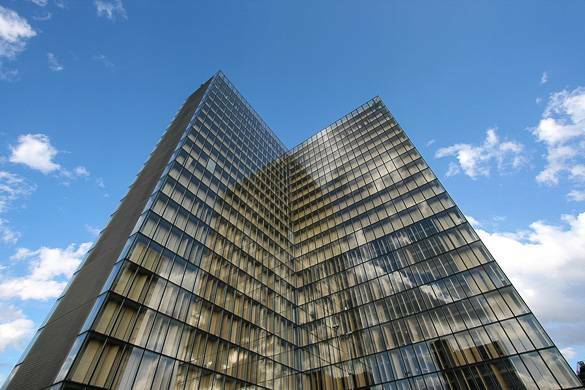 The National Library of France, better known as the BNF, is an amazing modern building located in the 13th arrondissement of Paris. Built in 1996, the library is made up of four large glass and chrome towers shaped as books. These towers hold the library’s permanent collection of over 14 million books. In between the towers is a central garden with beautiful old pine trees. The library is completely free to visit, and whether you come for the architecture or to peruse the historical books of the permanent collection, the BNF is sure to make for an intriguing visit. Like the museums of Paris, you can visit Paris’ most famous monuments for free on the 1st Sunday of every month. Do note that this only applies off-season between November 1st and March 31st. Among the monuments you can visit for free are the Arc de Triomphe, Chateau de Vincennes, the Panthéon and the Conciergerie. 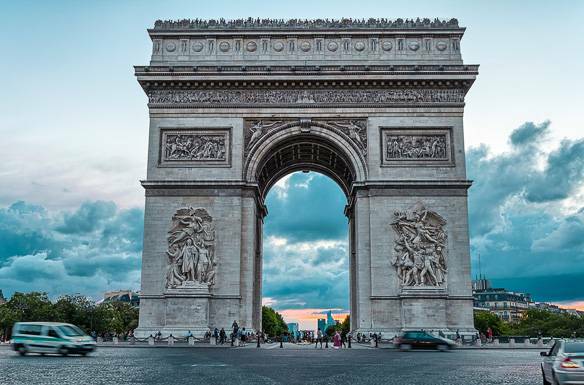 For more information about the Arc de Triomphe, see Visit the Arc the Triomphe. You can also climb the towers of the Notre Dame Cathedral for free. Be aware that the entrance for the tower visit is located outside the Cathedral on the left side of the façade. The Cathedral itself is always free to visit. The Arènes de Lutèce is a Roman amphitheater, and one of the most important remains of the Gallo-Roman area of Paris. Built around the 1st century AD, the amphitheater consisted of a sunken arena with a stage and surrounding terraces that could fit up to 17,000 viewers. The amphitheater was used for both theater performances and combat. Today you can visit what remains of the amphitheater for free in a small park called the Place Emile Male close to the Jardin des Plantes in the Latin Quarter. You don’t have to pay a fee to see the Eiffel Tower at its most beautiful. Every night the Eiffel Tower sparkles for five minutes each hour after sunset (until 2am). It’s absolutely beautiful to see the tower light up the sky, and the closer you are the better you’ll be able to see the individual lights flicker on and off like tiny diamonds. You’ll get some of the best views of the Eiffel Tower at the Champ de Mars, which is free to enter. You can even pack a picnic at home to bring to the park and have dinner beneath the sparkling Eiffel Tower! We have many vacation rental apartments available in Paris that come with fully equipped kitchens, which makes it easy to prepare your own dinner picnic basket. And if you can’t get enough of the Eiffel Tower, consider staying in an apartment like this 1-bedroom apartment in Invalides that has spectacular views of the Eiffel Tower! The Cimetière du Père-Lachaise is Paris’ most famous graveyard, and a hauntingly beautiful peaceful park in the middle of the busy city. The huge graveyard is free to visit, but at most of its entrances you can opt to buy a map of the graveyard for a small fee. This is recommendable if you want to visit a particular grave, as it can be quite difficult to find even the famous graves of Jim Morrison, Oscar Wilde and Edith Piaf. 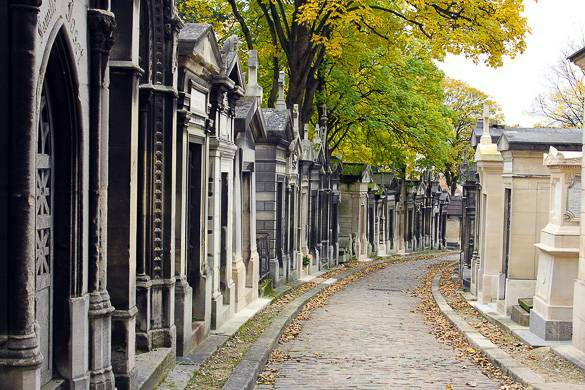 Visit the cemetery on a sunny day and stroll up and down the cobblestone streets beneath leafy trees. The elaborate tombs are quite a sight to behold. Paris’ famous department store Galeries Lafayette is a must-see for any lover of fashion. The department store features many designer brands and has a beautiful domed ceiling made of glass. Every Friday at 3 pm you can attend a fashion show on the 7th floor of the Galeries Lafayette. The show is completely free to attend, though seats must be reserved ahead of time. You can reserve a spot by sending an email to welcome@galerieslafayette.com. Also be sure to pay a visit to the neighboring department store Printemps after your visit to Galeries Lafayette. The top floor of Printemps has an amazing rooftop terrace that’s also free to visit and has 360-degree panoramic views of Paris! We hope you’ve enjoyed this list of our top 10 free things to see and do in Paris! What’s your favorite free place in Paris? This entry was posted in cruising, Deluxe travel, France, Luxury Travel, Paris, Uncategorized and tagged cruising, europe, river cruises, the cruise butler, travel, traveling by The Cruise Butler - Travel agency. Bookmark the permalink.